The books in this series by Caroline Jayne Church are wonderful. The first one we read was Here Comes Halloween! and now we have this one. These books are wonderfully illustrated and have great stories. 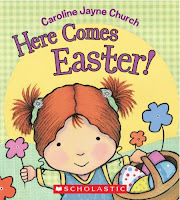 It is the story of a young girl's Easter - finding hidden eggs, following a jelly bean trail and finding a big surprise. There are textures to touch and items embedded in the pages for younger children to explore and the story will keep older children entertained. My three year old daughter loves this one. I was pleasantly surprised by it myself. We bought it one day to keep her occupied in the car and she keeps going back to it.